Boo, clap, cheer? What shall I do as a Oklahoma City Thunder fan? 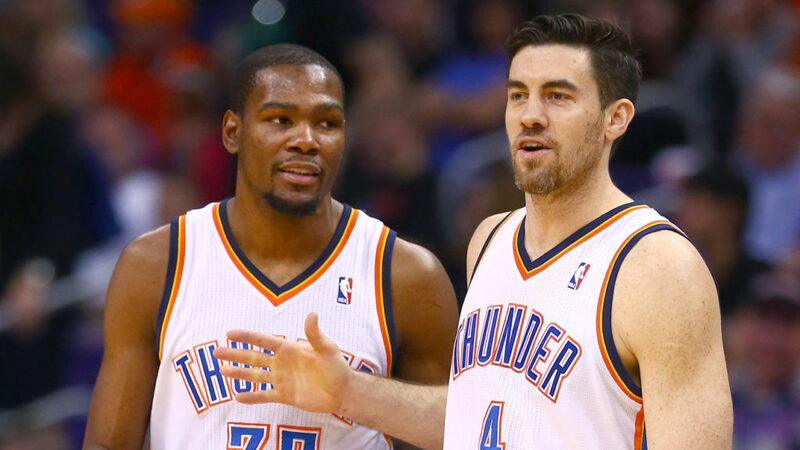 As a season ticket holder from game one first season through tonight game with the Milwaukee Bucks, I have earned an opinion on how OKC Thunder fans should act on Nick Collison’s number retiring game in March with regard to the appearance of Kevin Durant at said honoring. First thing to remember, that night is for NIck Collison. He owns that number “4” for the history of this franchise on Reno Street in OKC. He earned it through his play, his Thunder attitude, and for nothing else as a bonified one-hundred percent representative of the team, the city of OKC, and finally, the sport of basketball. He is, until Russell Westbrook retires, Mr. Thunder for many of us. He is the embodiment of many things, but most of all, of being a team-mate of those that played with him. If Kevin Durant is welcome by Nick, so should we welcome Kevin. If the Thunder can also welcome KD, again, so can we as fans. I, and many Thunder fans, do not have a positive feeling toward Kevin, and some of us might never have that forgiveness in their regards to the man. But again, it is time for Thunder fans, not to forget, not to forgive, but to understand that Mr. Durant had the itch to leave this city and move on. He has and it is time for us to do the same with him, move on down the street to Western Avenue. As for me, will I boo the man? Will I clap for him? Cheer for the great one? Kevin Durant, I hope someday you can be the man Nick Collison is, with regard to team, city, basketball, and life. Only the best for you. I hope you find out that having fun is not the goal of life. That winning NBA titles is not the goal of life. Maybe this night you might learn that there is more to life than having a wonderful mother that loves you and you can be honored as a man and not for your accomplishments on a wooden basketball floor. I hope one day you might have your number retired too. But to have that in your future, you will have to understand what Nick Collison already knows. It is personal with Nick. It is how you treat your friends. Real friends. I do think Nick is one of your friends. Your internal “light bulb” has to turn on and it has to be about others and not yourself. I wish you well. If introduced to the crowd that evening, I will do neither (boo or clap). I will stand in my section of Loud City, and when and if his name is called….yes…..I will stand in my section of Loud City, silent. A silent welcome that is what KD deserves.